Alright you got us, we admit it. This Verana is one of our favourites! We know we’re not supposed to play favourites, but once in a while a design like this one really steals the show. It’s a definite conversation starter and a completely unique building. 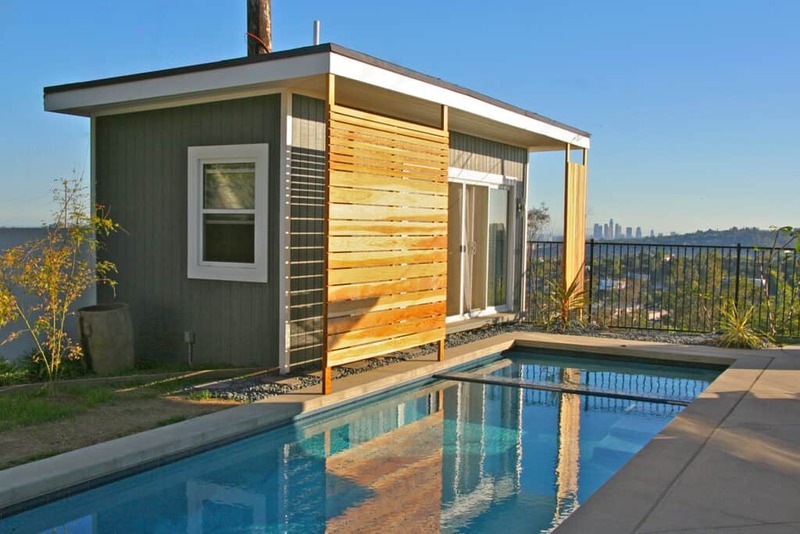 We’re often asked about this particular pool cabana since it’s both gorgeous and multifunctional. We thought we’d give you a behind the scenes look at both the interior and exterior of the space, and tell you all about how together with the family we arrived at this spectacular final product. Residing in California, the owners of this fabulous Verana were faced with a somewhat common problem: a small and oddly shaped backyard. As we design and build custom structures, our customers often come to us with this issue (check out our post on Our 5-Sided Corner Building which often offers a quick and creative solution). In this case, the yard in question is very long, narrow and already includes a pool. The challenge here was to create something that could function as both a pool house and an office, didn’t alter the layout of the existing yard and most importantly, took advantage of that view! So, instead of having to redesign the already lovely backyard we worked together with the family to create this long and narrow construction that would meet their needs. The resulting 9×22 foot structure is breathtaking, practical and snug in its hilltop home. With limited space both inside and out, it’s important to take purpose into account at the beginning of the design process. Our customers needed their pool house to do a little bit of everything: function as an office, include a wet-bar hang-out area, and a convenient washroom. They also wanted to ensure that their amazing view remained unobstructed, do you blame them?! That view was of paramount importance throughout the design process. Once a layout was decided we focused on including features that would take advantage of both the view, and the California sunshine. Natural light opens up a space and makes it feel bright and airy, so large windows and doors were incorporated. We designed custom 4 panel double doors to allow for a “wall” of light. This also presents the ability to open up the space, allowing for instant indoor-outdoor living. We were so happy with how these exceptional doors turned out, we decided to include them in our accessories roster. Head here to view the full collection. The interior design is just as sleek and modern as the exterior, featuring a contrast between airy white fabrics and bold leather. The additional wood details, both inside and out bring warmth and a natural look to the space that offsets what could otherwise be a harsh contemporary design. To continue the breezy theme, the building also includes clear furniture and accessories such as tables and lamps to truly allow light to travel through the area. When you’re finished working, head straight through those extensive doors for a little dip and finish off with a hot shower, all right in your very own backyard. Make sure you check out our last blog post if you’re interested in designing your own perfect pool house, we’ve got the steps to get your started. Our Design Center will really get those creative juices flowing, and when you’re ready for details be sure to Contact Us so we can help make your dream building a reality. When it comes to selecting construction and building materials for your own shed you’ll find that everyone, be it your neighbor, brother-in-law, or kooky uncle is an “expert” and will provide you with lots of different ideas. Rather than having to scour your local building supply store begging for some suggestions, we’re breaking-down our top two construction materials for building your own shed as part of our DIY series (check out our posts on Choosing the Ideal Garden Shed Location, Interior Design Features and Roof Choices as well!) At Summerwood Products, we have been using these materials for over 20 years. They’re tried, tested and professionally approved! Definitely our favourites. A wood of exceptional beauty, Canadian Western Red Cedar is noted for its rich grain, texture, and color. Typically you’ll want to look for interior growth select tight knot (STK) cedar or clear cedar, meaning the wood is fine grained and free of loose or open knots. This is a product carried by select lumber stores and has varying availability depending on your location. It looks great and it lasts for years if you treat it right. Using cedar as a siding allows your building to integrate beautifully into the natural landscape of your backyard. At Summerwood we recommend that cedar siding be stained to keep it looking like new, year after year. Stain gives your shed a finished look and also ensures that the beauty is protected while the elements are left out! For those of you who aren’t interested in any staining or maintenance, we’ve got the perfect option for you. Canexel is a pre-treated, factory-made wood fiber siding that comes in 21 beautiful colors. Suitable for any structure or style, it is tough and durable, but is also popular because of its maintenance-free qualities. Canexel blends the look and texture of wood with the allure of not having to do any painting or staining. Just pick a color, install, and enjoy! The wood grain appears natural and no two boards are the same, so your building will never look plastic or phony. A painted-wood look without the work, you really can have the best of both worlds! If you’re not sure which siding is best for you, don’t forget to factor local climate conditions into the choice that you make. The design experts at Summerwood are also here to help! If you’re not feeling up to building a shed from scratch, check out some of the great DIY building kits made by Summerwood Products and customize your building with Cedar or Canexel siding right now! If you’re looking to upgrade your building with insulation or a moisture barrier, check out our Siding Information page for more info on our Enhanced Siding Package. One of our favorite annual events takes place in the Summerwood design office every spring – our extremely popular Photo Contest winners are chosen! We’re blown away by our customers’ enthusiasm for our contest and love picking through the latest photos and awarding cash prizes. Our top prize winner takes home $250, second place takes $150, and third place is awarded a cool $100. Not bad for sending in a few photos of your outdoor project! Remember that if you have photos that you haven’t sent in before it’s never too late to do so; send us your photos today and we’ll enter them into the 2016 contest. Once again our Ultimate Glen Echo “Permit-Free” Bunkie was a monster hit among customers looking for extra sleeping space at their vacation and cottage properties. This gorgeous Western red cedar bunkie blends in with the trees and serves as a real lakeside retreat in Ontario – a real asset to any cottage vacation rental looking for “permit-free” sleeping and storage space. The double French doors let in tons of natural light and also allow for storing oversized items over the winter months. As always a pull-down ladder for loft access and lots of opening windows are staples of this building design and allow for relaxation and cool breezes to flow in. The customer-built front deck looks like a great spot to kick back in a comfy Adirondack chair and listen to the waves lap up against the shoreline. Congratulations to our first place winners and recipients of our $250 cash prize! While we love classic garden shed designs we also love when our customers push the envelope and allow style and function to blend together. Our Oakville-based customer was looking for a garden shed that would immediately blend into her yard and feel like it had been there for years. To solve her storage and design dilemma we custom-designed this 104 square foot beauty which was painted to match the existing stucco home. One of the coolest features of this particular shed/studio is that the customer chose to partially insulate the building. Why’s that a good idea? By insulating the floor and wrapping the building with moisture-resistant vapor barrier this customer could easily finish insulating the walls and roof down the road and would have a 4-season studio space. This can be particularly valuable in the event you may need an office or extra guest room, and can also be an enticing feature to potential buyers if you were selling your home. We adore the transom windows on the sides of the building that let some light into the building but don’t sacrifice the privacy and security of the items stored within. The frosted glass on the front doors will keep the building feeling airy without showcasing the not-so-pretty items stored inside, and a small deck and simple pot lights add to the charm and character of the building. The roof overhang of this building was customized to fit within a tight space and to conform to local bylaws and will keep anyone using the building dry regardless of the weather. Congrats to our 2nd place finisher! What better place to cool off from a refreshing swim or to relax with a cold drink on a hot day? Our Surfside cabana truly lives up to its name on an everyday basis and is one of the most popular pool cabanas with customers and industry professionals alike. These customers were after a building that would blend indoor and outdoor living and would blur the line between inside and out. Huge sliding French doors were the perfect solution! A simple whitewash of the interior makes the building feel bright at any time of the day and some simple yet beautiful décor make this the place to be when hanging out close to the pool. The cedar shingles will age to a silvery grey and will last a lifetime, adding character and definition to the building throughout the years. So there you have it, our 2015 photo contest winners! Ready to start the process on designing your own custom structure? Click over to the Summerwood Custom Design Center or contact a design consultant today! Have pictures you’d like to send to us? Email them directly to [email protected] or use our online photo upload tool. Check out our Photo Contest page to see past winners, we’ll also soon profile our 2015 honorable mentions on this page as well.